BMSIS Young Scientist Liz Miller led an outreach event at the Red Hook Public Library in Red Hook, New York. Beginning with a scale model of the solar system, the children built spaceships with the idea of trying to reach different planets. The activity culminated with a competition to see how far they could “fly” their spaceships. 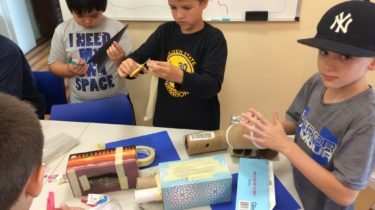 This combination of arts, engineering, and science helped teach about the solar system and space travel. Liz’s engagement was part of her communications requirements for the BMSIS Young Scientist Program.